Debate: Is it proper for China to grow GM rice now? Permission to allow field trials of genetically modified (GM) rice seed has raised food safety concerns. A scientist and a journalist take an opposing stand to a US political science professor. China's food safety laws and regulations are largely based on the guidelines of the US Food and Drug Administration (FDA). But are the FDA prescriptions reliable enough? In 1992, the FDA turned a blind eye to strong protests and even the opposition of its own scientists to state that genetically modified (GM) foods are as safe as any for human consumption and, hence, there was no need to give an explanation about GM foods. This move was widely criticized as arbitrary, given the role one Michael Taylor played in the case. Taylor was then assistant FDA commissioner but soon left to serve as chief legal adviser to Monsanto, the world's largest seed company. Moreover, a new law drafted by Taylor did not consider facts found in a research from 1958 that illegal pesticides and food additives could cause cancer. Food safety laws in China have become a subject of public debate again after the Ministry of Agriculture granted permission to carry out trials with GM rice seed. GM seed companies claim their products could raise crop output by 15 to 40 percent, which many experts believe to be an exaggeration. What has been proved, instead, is that GM seed are unable to adapt to abrupt climate changes and may thus cause sharp drop in output. Last year, South African farmers who had planted Monsanto's GM corn seeds 820,000 hectares reported crop failure. This is a scary fact. And China, which has a huge population to feed, cannot take the risk to try out GM grain seeds. Scarier is the fact that GM seeds lead farmers into a vicious cycle - the more crop failure they suffer, the deeper they get into the cycle. GM seed companies also claim their products require much less use of pesticides. But statistics show no considerable reduction in the use of pesticides on farms where GM seeds had been planted. Instead, GM seeds raise a big health concern: The sharp increase in the use weedkiller genes, introduced genetically in the seeds. These genes can enter the human body. As early as 2000, German scientists working on GM colza pollen found the use of weedkiller genes had altered honeybees' enteric genetic structure. Cannot this kind of gene transformation occur in humans who consume GM food? Experiments on animals have proved that GM foods have the potential to cause serious health damage even in a very short period. These tests show GM foods can harm animals' reproductive systems and raise infant mortality rates. 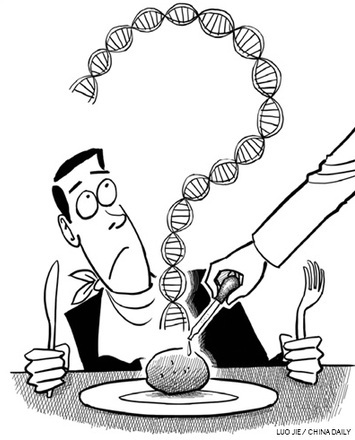 GM foods' gene modification could take generations to suit the human body. GM foods not only have the potential of harming the human body, but also of causing irrecoverable damage to the soil, that is, biological pollution, which is more dangerous than chemical pollution. Research has shown genes of micro-organisms and weeds have undergone changes in farms where GM seeds had been planted. But what can the poor end consumer do under the pressure of the multi-billion-dollar GM seed industry? Take the case of Fox TV for example. The TV channel, under alleged pressure from Monsanto, fired two of its reporters who tried to expose GM foods' for the harm they could cause to humans. In 2008, French independent filmmaker Marie-Monique Robin's documentary, The World According to Monsanto, was banned from being screened in the US. Perhaps, only the EU takes a serious and prudent view of GM crops. The EU has strict rules that make it mandatory for GM foods to carry labels with detailed information on the materials they contain. China should have taken all the above into consideration before allowing trials of GM rice seeds. American computer giant Hewlett-Packard has apologized for any inconvenience caused to its consumers due to the quality of its products and services.